Email Merge templates can be a very useful feature to both; save time and improve the quality of your emails. Sharing templates can spread these benefits throughout your organization. In this post, we share how you can create templates for Email Merge for Outlook and then share it with other users in your organization. EmailMerge for Outlook is used by Outlook users to create and send personalized copies of (usually) sales, marketing or informational emails to customers. Your company may want to create standard templates for all users of Email Merge to send out standardized emails to customers…. to maintain uniform messaging, branding etc. These templates could be sales emails, testimonial requests, new announcements etc. You cannot use normal Outlook or Word templates to do this. Instead you have to use the template functionality that is included with Email Merge. Details of each of the steps are given below. You will need to download and install Email Merge for Outlook in order to carry out the following steps. Once Outlook has started, select EmailMerge > Template Manager from the EmailMerge toolbar on your Main Outlook window. Click New button on the Template Manager screen. A new blank email will be opened. Compose your email using any Outlook function for the email message, just like when you create a regular Outlook email. Click Save Template on the EmailMerge toolbar/ribbon. This template will be added to the list of templates in the Template Manager screen. Select the template you want to export on the Template Manager screen. 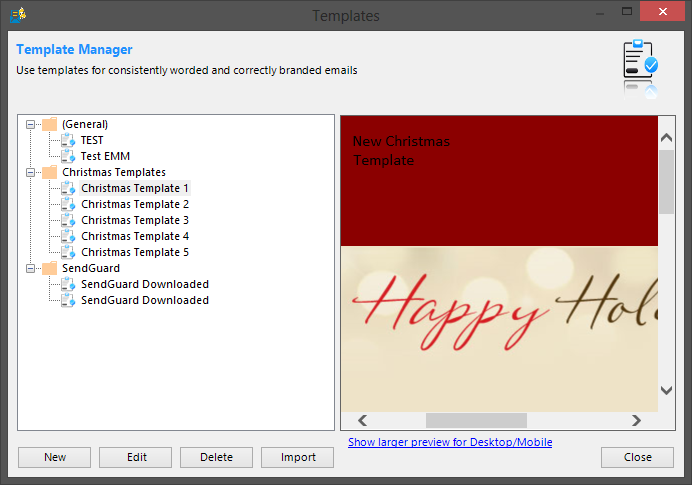 On the Template Manager screen, click on Import and browse to select that Zip file which has the templates. Sharing Email Merge templates can save time and improve the quality of your emails. If you haven’t tried Email Merge for Outlook yet, you can download a 30 Day trial version by clicking on the image below.